At Donington Nurseries we pride ourselves on our vast choice of growing medium. As growers, we realise the importance of good quality compost to achive the results you require. We aim to give you, the gardener, the choice by stocking Peat products as well as Peat reduced, Peat-free and Organic. Our range covers Chipped Bark, Multi-purpose, Vegetable Compost, Rose, Tree and Shrub Compost, Seed sowing, Grow bags, Soil improver, Lawn soil, Ericaceous (for acid soil loving plants), Top Soil, John Innes grades, and Manure. 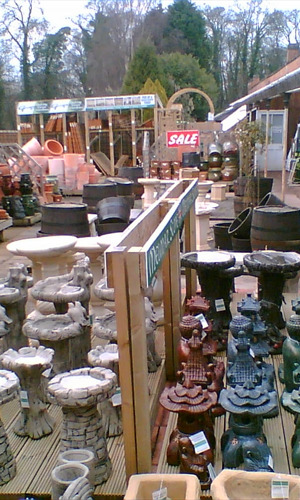 Donington Nurseries stock a good range of gravels and rockery stone. Eco aggregates – these are sourced from previously unused waste materials or bi-products from the ceramic, building or quarrying industry. These environmentally friendly alternatives reduce pressure on landfill and extraction, whilst providing attractive ‘gravel’ available in terracotta red and ivory. To complement the selection we also sell a range of stepping stones, edgings and weed membrane. DIRECT DELIVERY from quarry to your home is also available on gravels and rockery stone – there is a wider range to choose from and this is particularly useful if you require large quantities. There is also the choice of pre-packed bagged (ideal if you need to carry to various locations of the garden) or large bulk dumpy bag. Visit the Nursery to see the range and obtain a price.